To be frank, I was quite bored with yesterday’s episode. I feel that they spent too much time on the vampire thing, and it is just focusing on the gore factor. Well let’s hope it gets better. Same for me: it's the weakest in term of plot. I didn't expect that in a season with reduced episodes there could be a filler but it's what it is, except for the last quarter after the end of the case. But all the dramas last night suffered from it: apparently it's due to the asian games. Hopefully things will go back to normal quickly, there's only two weeks of the drama left! I don't get how those stupid vloggers managed to make a plan like that without being noticed by anyone else. They weren't very smart, an online audience wouldn't be so gullible, not in our times. Exposed in the plain light, the zombie girl wasn't scary just bizarre, so all those guys bigger and stronger than her getting attacked and bitten without reaction seemed very fake. How did she manage to cover on her feets such a long distance, after escaping the facility, to join the next town and to frighten the population before the police forces who had cars reached her? The presence of the aunt, screaming and crying at the end was too much and didn't really help to make us connect with the victim like it should. Girls being drugged and abused by greedy men is a real issue, that deserved a better treatment than this story gave it. A big disappointment after the care showed in the children sexual abuse story. Kwon Joo's face when she couldn't even look at Kang Woo in the eyes after his return to the police station. His hurt eyes when he realized she was trying to avoid him and couldn't bring himself to ask why/what happened while they weren't especially on bad terms, just because the rejection at one point was something he seemed to have expected. The tension between them in this brief exchange. It was really good acting from LHN and LJW. However it was sort of sweet how he seemed to have gone in circles, dealing with his feelings, before coming back to the GTT to see her and clear things. Was it his first time here? He seemed out of place and a little bit lost without her. Who was the little girl that Kang Woo saw when he collapsed? What did those images on the wall wake up in his mind or memory? It's the second time the masked killer gets a full acccess to a supposed confidential conversation between the GTT and Chief Na. Obviously, he doesn't have mics everywhere, so it can only be something placed on Chief Na, who by the way he's becoming more and more suspect. His admission that he thought his brother was a jerk, that himself took after his father who he hated for his style of life and had too an affair which made him feel like crap, his resentment/comtempt last episode where he blamed his brother for becoming a cop instead of a teacher without having what it takes to do the job, finally the fact that he thought his dead brother was trusting too much Kang Woo whom he believed was just using him made his obsession to charge Kang Woo more and more a revenge action than police work. 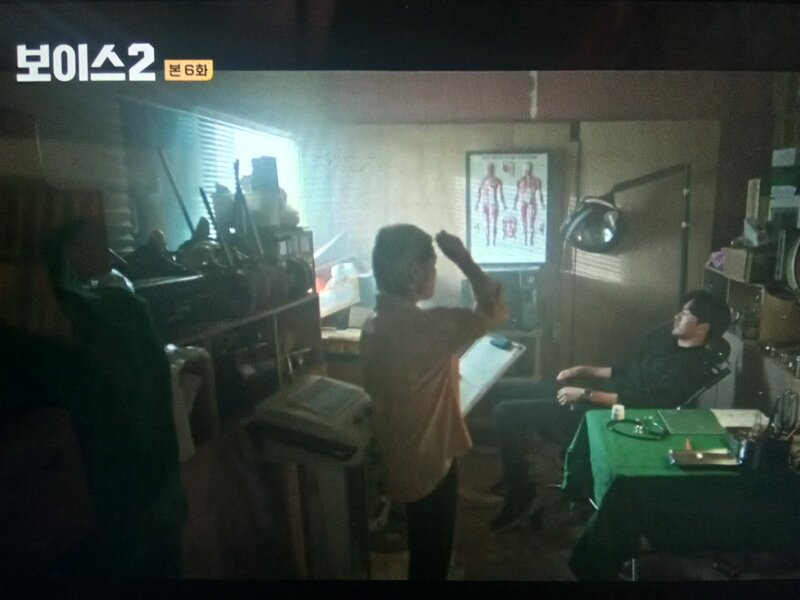 He had the opportunity and the infos to frame him: he knew that Kang Woo was having troubles with his memory. Actually Chief Na should have been a suspect too or at least shouldn't have been allowed to lead the investigation in the 1st place, considering his connection to the victim (like someone noticed in the thread but i can't remember who). The confrontation between Chief Na and Kwon Joo was terrific, full of electrifying energy. She did well and keep her composure but he was still the one in control: he had the knowledge (and was snarky about it, notably when he mentioned that she's close to Kwang Woo), and he had the material evidences. The fact that he brought a true info: Kang Woo doesn't remember that night entirely helped to defeat her in the end. How to deal with this incredibly confusing and ambiguous situation (did she really bring a killer inside the GTT? How to treat him if he doesn't remember his actions?) will be a challenge for which i think she needs to tell the truth to the team and to rely on them. One more reason to gather the GTT around her: i felt (and hated it) that Kwon Joo is becoming a pawn in the game played between Kang Woo and Chief Na. She's being instrumentalized by each men to make their point. The last time a character was caught between them (Chief Na's brother and Kang Woo's partner), he ended dead. So i don't have at all good feelings about this triangle. I'm looking for the next episode because i want to see how it will affect Kwon Joo and Kang Woo's relationship. When Jin Hyuk got the fake evidences that his wife was having an affair, she maintained her support and loyalty and keep her investigation to prove him he was manipulated. I wouldn't mind if she takes time to evaluate the situation this time because she's not as close of Kwan Woo though she's still obviously hurt by the situation. But i don't either want to see her manipulated so easily by the killer: his arrogance lead him to underestimate her intelligence and i want her badly to beat him at his own game. Oh man, I couldn't agree more with everyone who's disappointed with the last episode. I'm usually a casual watcher and don't pay too much attention to minor mishaps but this episode was just so incredibly sloppy even for me. Everything from the first few seconds till the end of the zombie drug case was sloppy. I wonder if they have a very tight filming schedule that so many mistakes were present. 1. The beginning of the episode felt like a different drama. First, KW went into that secret basement/room that didn't have any windows (based on the lack of signal) then what the hell was with the lightning and thunder. The editing was ridiculous, that lighting effect was too fake and looked more like a faulty video. Then what the hell was that projected tape and some random Japanese little girl? Who's that, how is this even connected to KW, what's the deal about it all? Clearly, there was no projector in the room. Was that a manifestation of KW's blackouts? Then it's not a random blackout, it's a hallucination and he clearly isn't able to move while he's experiencing this. Still, that was so random I don't know what to think of it. What do you guys think? 2. Right after the officers found KW and he woke up, he informed the centre that they rescued two victims and are heading to the next crime scene - the bitten taxi driver. But no one told him that they found the second guy, his colleagues only informed him about the bitten taxi driver. 3. After receiving a text from the killer the first thing KJ needed to do was to ask the hacker boy to track the sender and check the phone. Even if it was a burner phone they need to check it first otherwise there's no way they'd know that. 4. The whole part about the super strong and super fast zombie girl was also quite ridiculous as others have already mentioned. It really bothered me that she had perfectly white teeth when they should've been covered with blood. Hopefully, the quality will go back to how it was before for the 8th episode. I really want KJ to take some time to think things over and not take KW's, Chief Na's or the killer's words at face value. I find it interesting that the more "evidence" they show that KW is the killer the more I have doubts about it. The pictures the killer sent to KJ where KW is seen fleeing the police station were clearly done by the killer himself. If that's the case, then the killer was at the police station and he could've gotten rid of the evidence before KW, while KW might've run there to stop him. The killer truly is a master manipulator, I love that he's smart, but a bit too smart for my liking. When a bag guy outsmarts a the team of heroes all the time it starts to get on my nerves. LHN posted nice pics with YSM who plays Chief Na! It's nice to see their smiles! Apparently OCN has decided that there's no need to include LHN in the promo pics! She's doing the job herself on her insta and through her agency's account! Maybe the all the episode will be about open the old part of his past , I don't mind it he need to show kj his hands first , she has doing so much already giving him trust till now even when he hide everything and has zero proof of what he say. However it was sort of sweet how he seemed to have gone in circles, dealing with his feelings, before coming back to the GTT to see her and clear things. Was it his first time here? He seemed out of his place and a little bit lost without her. The same is my feelings. This interaction between LHN and LJU was excellent. A whole novel in their eyes. I've already written that this was my feeling from the beginning - KW used her and GTT. He said it to her directly, that ppl become policemen from very different reasons and the most of this reasons aren't noble. Chief Na said abt KW almost the same: he's got a good brain but it's useless if he isn't a human being but a monster to begin with. KW knows how to use ppl and he can do it. It doesn't mean that his feeling not change, but his intention is the same. Maybe we will see the struggle between his feelings and his intentions? An interesting thing from ep.8 - the Japanese girl KW saw was killed years ago. KW went to Japan in the past and Chief Na suspects him of killing her but at the end of the episode, they showed that the killer has that little girl's ear. Apparently, the killer said that the girl had enhanced hearing abilities just like KJ. So basically the killer killed the little girl, but KW thinks that he might have something to do with her death. An interesting thing from ep.8 - the Japanese girl KW saw was killed years ago. KW went to Japan in the past and Chief Na suspects him of killing her but at the end of the episode, they showed that the kille﻿r has that little girl's ear. Apparently, the killer said that the girl had enhanced hearing abilities just like KJ. So basically the killer killed the little girl, but KW thinks tha﻿t he might have something to do with her death. 2. okay KW was in Japanese till third grade that made him was like 10-11 years old only, the killer at the best stage in the same age as KW if not younger from him what happen to think that KW or even the killer start killing human and taking their parts in that age!!!!!!!!!!!!!!!!!!!!!!!! one moment something i don't understand about this killer which human being he interesting on taking their body parts, something not fitting, he shows he interesting in taken dirty people and taken the part that they made mistake with but after that what he interest in KJ that clean just cause her hearing ability ????????????????????????? 2. okay KW was in Japanese till third﻿ grade that made him was like 10-11 years old only, the killer at the best stage in the same age as KW if not younger from him what happen to think that KW or even the killer start killing human and taking their parts in that age!!!!!!!!!!!!!!!!!!!!!!!! I'm not sure if the killer started killing as a teenager but the gift box with the Japanese girl's ear was labelled - 1991.06.02 - Miho (ear). So he started collecting body parts years and years ago. His fridge had tens of gift boxes, like seriously very many gift boxes with body parts + today he killed his neighbour ajumma (took her tongue) and killed the guard, framing him for everything. What I don't get is how is possible for KW to know the little girl and the killer if the murder happened in 1991. That's crazy. The fact that the killer blamed the guard in this new murder makes me think that maybe that's what he's been doing for his many other murders. So maybe KW is a victim in all of this. At this point, I think that everyone is an unreliable narrator except for KJ. I don't even trust the flashbacks that they show, I'd rather only believe her and her only. I'm not sure if the killer started killing as a teenager but the gift box with the Japanese girl's ear was labelled - 1991.06.02 - Miho (ear). So he started collecting body parts years and years ago. His fridge had tens of gift boxes, like seriously very many gift boxes with body parts + today he killed his neighbour ajumma (took her tongue) and killed the guard, framing him for everything. What I don't get is how is possible for KW to know the little girl and the killer if the murder happened in 1991. That's crazy. The fact that the killer blamed the guard in this new murder makes me think that maybe that's wh﻿at he's been doing for his many other murders. So maybe KW is a victim in all of this. At this point, I think that everyone is an unreliable narrator except for KJ. I don't even trust the flashbacks that they show, I'd rather only believe her and her on﻿ly. 1.there was another killer in the paSt I don't think it kW but maybe it was his father, the masked killer talk about that Japanese girl ear as someone he didn't know , he just hear about her from someone also, it like he inherit the job and the body parts from the old killer !! 2.so kW till third grade was never at school ohhh so that proof to our thoughts that his father was the sychopath person, I think that why kW think he too maybe had that. So did he has only one friend and it was that little girl that asked him to play with him and his father killed her ?? Or let think in different way that girl come from.the family of sychopath and kW was involved with them since he was her friends?? ?maybe she was the new killer old sister !!! Everything will be clear when we know who that girl and how she connect to the killer and kW?? I agree about the KJ part. She usually keeps a perfect poker face and partially did it in her conversation with Chief Na but it really throws me off when she's trying so adamantly to not look KW in the eyes. That's such a dead giveaway, she's not even trying to be subtle. Then again there might be a couple of reasons why she's doing that. For one, she's always been a straightforward person, as far as I remember from season 1, and she always confronted anyone and anything that bothered her upfront, so now she might be feeling not so great that she has to go and secretly investigate her current partner behind his back. Plus she believes that KW had sincerity and good will in dealing with the victims, she saw it, she heard it, she knows that he wasn't faking it, but she also understands that there might be a different side to KW that he himself might not be fully aware of. Basically, KJ is between a rock and a hard place right now. One thing I wanted to be done differently is her actually confronting KW with the pictures, the medicine, everything she gathered instead of secretly investigating. After her talk with Chief Na and after KW told her to ask him directly if there's something she's suspicious about, I would've preferred if she went like "Hey, here're the pictures and the killer's text, then there's medicine and the fact that you have violent tendencies but don't remember anything. How 'bout you explain." And after she gave him a chance to present his point of view, then she'd go and investigate the things that didn't add up. That's actually what I came to expect from KJ. The fact that she kind off ignored KW texts about the investigation was out of her character IMO. I've yet to watch episode 8 with subs but while watching RAW I had a thought that it would be better for my mental health to just watch last 4 episodes together. By the end of the episode I was exhausted trying to figure out if KW is or isn't the bad guy. I seriously hope that he isn't because I want our girl KJ to have at a normal partner and person she can safely confide in. I'm so sad that KJ is basically left all alone this season and doesn't have anyone to trust or simply talk to with JH being away. If only for that reason I want KW to not end up the bad guy, plus it would be an overkill to have so many psychopaths in one season. Like serious why is GTT surrounded by so many psychos - the killer, then his new accomplice from ep.8, then ES's ex boyfriend, a whole network of sick in the head people. Wouldn't it be too much if KW was also the bad guy? If he is then where's JH when you need him? Come back and do some a** kicking. This show is just too good at creating confusion about Kang Woo that's for certain. Apparently the biggest mystery of the show isn't what these insect-loving anarchists are really up to (because they're basically megalomaniacal nutters with serious Mummy issues) but the past of the so-called psychopathic detective. Whatever the faults of Episode 7, Episode 8 sure made up for them. It's true that Episode 7 dragged on a bit longer than was necessary with a lot more focus on the villainy than is usually the case. It didn't take long for us to work out that David Ko was up to no good and fabricating the entire scenario for his X-Files programme. It isn't just the drug taking that was the problem or worse still that he forced fed the zombie girl "pink salts" to raise viewership ratings but it was also a commentary on the voyeurism of our time. David's megalomania was fed by in part by a public hungry for bigger and badder online content. He fed their insatiable curiosity and they fed his ego. Episode 8 had me on edge the entire time. So much cruelty and megalomania from the bossy neighbour to the lift repairman. For some reason the death of the security guard hit me harder than anything else. Poor man. He got dragged into being the fall guy in the murder of the chairwoman. The sheer arrogance of the conspirators really really hit home in this episode. How do people start thinking that they're above the law, that they're better than the rest of us, that they have the right to stamp out fellow human beings as if they're no better than ants? Perhaps it is the logical consequence of holding to a certain strain of evolutionary thinking. I see that our coast guard Norman Bates styles himself as Dr Fabre in his chatroom with his fellow conspirators. Fabre was a famous French entomologist of a hundred fifty plus years ago. But he was strictly an observer of insects who wrote books about insects. And he was no evolutionist. For a while I did wonder how it was that abusive ex managed to grab ES so quickly after she had escaped his clutches and then became suspicious that it was all a set up. Which it was. In the end he too became a pawn in a bigger game. A serial dating abuser from a rich family that helped cover up his "bad habits". The conspirators once again channelled his anger unhealthily to cause problems inside the team. So it's divide and conquer... On that front, it looks like the "baddies" are winning. He's managed to plant a seed of suspicion and it's taken root. On some level I can understand why the Chief Na doesn't trust KW. Obviously he has reason not to BUT he is so fixated on KW as being the killer to the point where he's not even considering other possibilities. I am glad for KJ to investigate KW's background not only for her to be certain that he is someone that he should be suspicious of but for us to put all the pieces of the puzzle together in terms of where KW fits into the larger conspiracy.